If you’re one of the folks worried about the how AI will replace humans in the future, this latest development might add fuel to that fire. 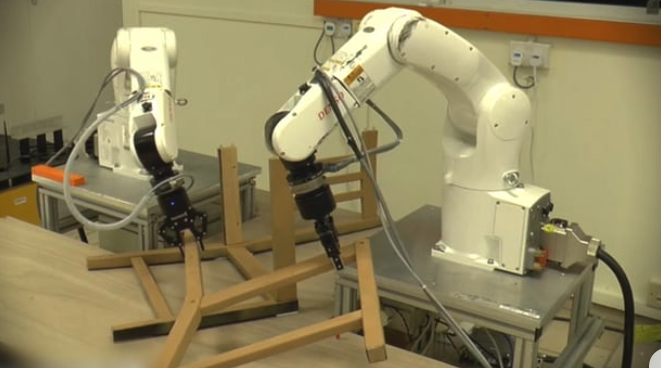 Researchers from the Nanyang Technological University in Singapore have built 2 robot arms, powered by deep learning and 3D sensors, that can assemble a workable IKEA chair. The 2 robotic arms, working together, completed the job of assembling the chair in 20 minutes and 19 seconds. All the parts required to build it were first placed in front of them. The AI took almost ten minutes deciding how to go about building the chair and then spent the next nine minutes doing the task. According to an Ikea representative, it takes a person 10-15 minutes on average to do this task. If you’re a regular follower of AVBytes, you would’ve guessed by now that this task did not happen at the first attempt. It took a lot of training data and multiple failed iterations to finally get the AI right. The training data included things like images of how chairs looked, how different parts are glued together and where, etc. The research team is hoping this technology will be more mainstream in the next 5-10 years. These are scary and exciting times in the AI world. We have previously seen AI being able to cook burgers and another AI able to sort through our stuff in a human-like fashion. Studies likes these are paving the way for AI to penetrate through in the industry for tasks like building computers, vehicles, and even complete houses. But that is a long, long way away from now. AI, despite it’s recent rise, is still very much in it’s nascent stages. Machines still struggle to differentiate between moving parts and require tons of data to be trained on. What do you think about this technology? Does it scare or excite you? AVBytes: AI & ML Developments this week – Pandas to end Python 2 Support, Intel’s Framework-Neutral Library, Google’s Cancer Detection Algo, etc.